Written by two leading experts, this book can help you whether you are studying for an important exam or simply want to improve your knowledge. The first half of the book introduces the reader to the essential concepts within political philosophy, such as freedom, equality, power, democracy, rights, and the state. 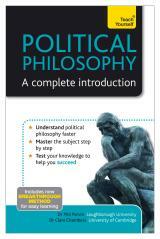 The second half of the book looks at how influential political philosophers, such as Plato, Rawls and Mill, have used these fundamental concepts in order to tackle a range of normative political questions such as whether the state has a responsibility to alleviate inequalities, and what role liberal and democratic states should play in regulating the cultural or religious beliefs of citizens. This entry was posted in all posts on liberalism, Teach Yourself Political Philosophy by CChambers. Bookmark the permalink.